Once upon a time, there was a puppet who was brought to life by a blue fairy. She informs him that he can become a "real boy" if he proves himself to be "brave, truthful, and unselfish". This puppet's name was Pinocchio. This is a FICTIONAL story. Once upon a time, there was a "real boy" who came to life when he was given a second gift of life. Upon birth, this little boy existed to be probed, stuck with needles, attached to tubes and machines, and basically given a death sentence (according to the doctors). He was not expected to live. He didn't have a blue fairy to save him. But he DID have a Heavenly Father who created him, cared for him, who never left his side through all the trials, and who saved him even though he was not brave (he did not choose this) or unselfish (babies are selfish!). It was the grace of God that saved him. God gave him a "second birth", with the gift of a new kidney from his mom. That was the day this "real boy" actually came to life. That day was 30 years ago today. This is a TRUE story. I have so many emotions when I look back at this day. And remember exactly just like it was yesterday. I remember seeing my son being wheeled away to the Operating Room, wondering if this really could be the answer. 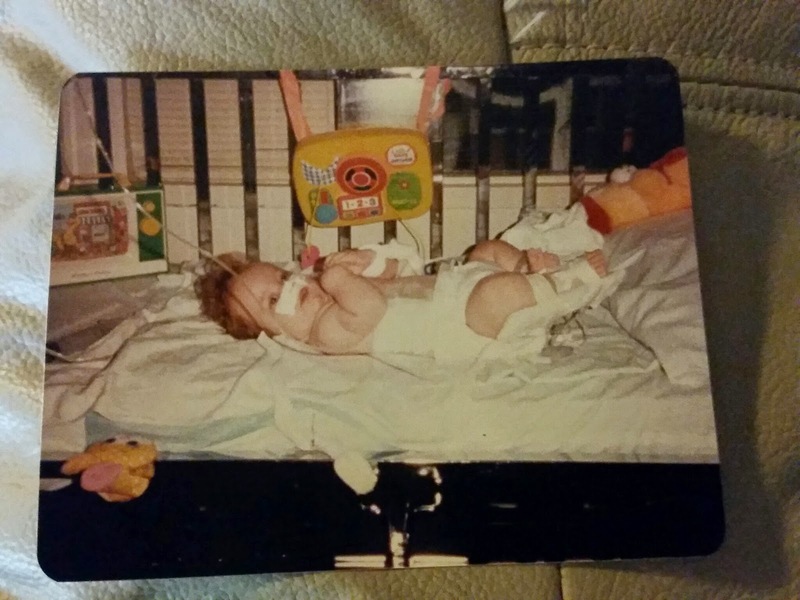 We had spent over 250 days in the hospital in Derek's first 16 months of life. He had over 9 operations. He was "expected" to die more times than I even care to count. Yet, here we were, being placed into adjoining operating rooms, where doctors would take my kidney and walk it into his operating room and place it into his little body. Doctors said as soon as the "connection was complete", he passed urine right there on the table before they even closed him up. My kidney was an almost perfect match for him! I will never forget what it was like to see him for the first time after the operation. This would be the first time I had seen him since he was five months old where he wasn't attached to any machines. The last time I saw him, his skin had been a dull gray, lifeless color. His eyes were cloudy, dim. As I walked into his room, I saw him in the crib. He turned to look at me, and I saw red, rosy cheeks. And his eyes. His eyes just sparkled. Like I had never seen them. He was alive! And from that point on, there was no turning back for Derek! Derek has a zest for life like I've never seen. He lives his life with all the fervor and excitement like he knows what he had been missing. Life is to be lived, fully, and that's what Derek does. He proves that life is precious to everyone! Happy anniversary to my sweet boy, my eternal toddler. Mommy loves you more than you could ever know. But not nearly as much as your Heavenly Father does. "Tis the season to be jolly, fa la la la la, la la la la." We all go through seasons in life. We have our ups, our downs. The Christmas season is typically an "up" season; we hear all the songs telling us "it's the most wonderful time of the year", or as stated above, "tis the season to be jolly". But for some, it's not such a wonderful time of the year. Maybe it dredges up old memories that are not so pleasant. Maybe it's a more lonely time of the year for some people who don't have family members or friends to enjoy the season with. There are many who can't afford a decent Christmas dinner for their family, or cannot buy the presents they would like to for their kids. All the happiness surrounding them during the month of December seems to grate on their last nerve. This year, I'm struggling to not be one of those people. I've always loved the Christmas season; from the decorating of my home, to the delicious goodies just waiting to be baked and eaten to the visits from family and friends, and of course, the gift giving. I love watching my family open their gifts. It's always been one of my favorite holidays. But this year, I have to watch my mom as she enters the end-of-life struggle. Mom has lived with us for about 9 years, and during the last four years the despicable disease of Alzheimer's reared its ugly head and invaded our lives. Mom has fought this disease with every inch of her being. She's a tiny woman, with a mighty strength. She wasn't going to give in without a fight. I could go on and on about how I despise this disease, but I won't. Just know I wouldn't wish it upon my worst enemy. Mom took a turn for the worse a few days ago, and her body is shutting down. To watch her struggle for every breath is torture for me, never mind for her. I'm in a very strange place right now. I don't want my mother to go. But the shell of the person she was is all that's left. But I can't grieve for her, as she's still "here". I take care of her, but the best I can do is make her "comfortable". I take care of her knowing she can't be saved, there is no hope of that. I've been a caregiver for the last 31 years, making sure my son Derek stays well with all his medical issues. So this situation is extremely difficult for me. So, I am clinging to the promises of God; I am thankful for each one of you who have offered love, prayers and support; thankful I've had my mother for 86 years; thankful she is able to be in her own home as she prepares for her next journey; and thankful most of all for Jesus, the real reason for the season! Three weeks ago I was in a doctor's office with my son, waiting to receive results from an MRI that he had done the previous week. I never saw it coming, the "punch in the gut" news that fell on my ears. The news that told me my son's hip bones were dying due to a lack of blood supply that is a result of 29 years of steroid use. These same steroids helped save my son's life 29 years ago, as they are a mandatory drug that he has to take to keep the kidney that was transplanted into his body when he was 16 months old. Ironic, wouldn't you say? 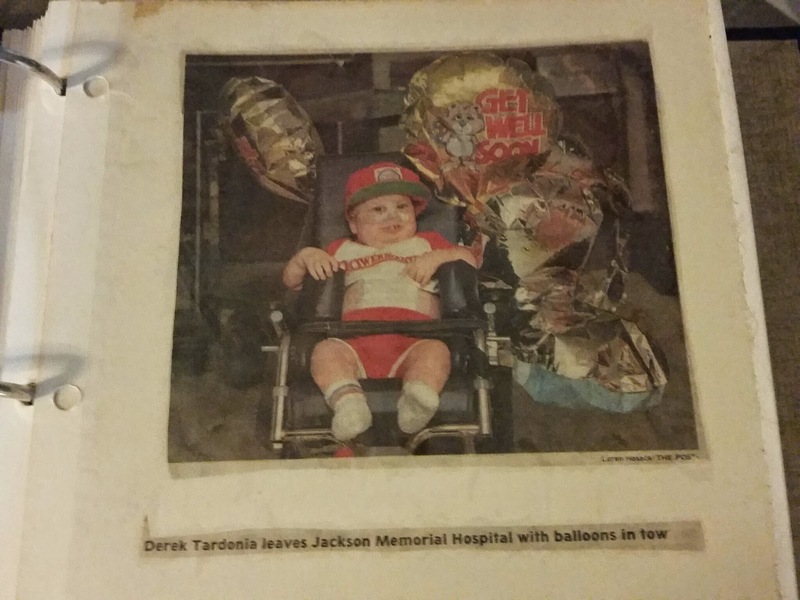 Derek was the youngest kidney transplant recipient that the University of Miami had performed back in 1985. I was an almost perfect match for him, so they removed my right kidney and put it into his tiny body. He came to life that day, and has never looked back. Derek is a force to be reckoned with. He is full of life, full of love, and the happiest person I have ever known. He loves with every bit of his being, and experiences life like someone who knows what it's like to be given a second chance at living. He just turned 30 in November, but he will always be my special needs "eternal toddler", acting like a 4 year old most of the time. Derek is also deaf, and I grieved when he was diagnosed at 2 years old. Grieved because he would never hear my voice. Because he would never hear beautiful things like the birds singing, music, laughter, and a gazillion other things. But I believe one of the main reasons Derek has lived these 30 years is BECAUSE he never heard the negativity associated with his condition. He didn't hear the doctors say he was not expected to live, not expected to walk, not expected to....countless other things. God had bigger plans for Derek, and the doctors were proved wrong. I have given this much thought since hearing the current diagnosis. Derek doesn't know what's coming. I wish I didn't. Ignorance IS bliss. He just knows he is in pain, but doesn't know why. Doesn't know that at some point his hips will just disintegrate. Doesn't know he isn't a candidate for a hip replacement. Doesn't know the only thing we can do is treat the symptoms, treat the pain. Doesn't know, at some point, he will not be ambulatory any more. Derek just keeps plowing through the pain. Living life the only way he knows how. How thankful I am for his not knowing. I know so many things after living with Derek these 30 years. I know how precious life is. I know no one knows the future. I know God has a plan. I also know I need to trust God. I know I shouldn't be looking at all the "what if's". I know I need the strength only He can provide because I certainly can't do this on my own. I know all these things.....but getting from here to there, well, I haven't done that yet. It's a journey, another storm to weather; and of all the storms I've made it through, I'm finding this one pretty tough.What I DON'T know is how to face this diagnosis with just a plan of treating the symptoms. I don't know how to face watching my son suffer so much pain. This mother's heart might surely break into pieces watching this happen, watching the life that he knows fade away. God doesn't spare us from the storms; but He does promise He will be with us in and through them. He has never let me down, nor will He. I'm trying to move forward, to get stronger. I'm diving into my Bible, into my daily devotion book that has helped me through countless other impossible situations by leading me to the source of strength, God. The tears come without a moment's notice, lots of them; sometimes I feel like I can't even breathe. Just yesterday, I asked my dear sweet husband, "and what do you do when you just can't stand another minute?" His answer: "Fall to your knees." I think I may need to get some knee pads. Two years ago today, I had thyroid surgery to remove the remaining portion of my thyroid due to the growth of large nodules. There were no complications when I had the first surgery three years prior to this. I had no reason to think things would be any different this time. However, this was not the case. The main risk of having this type of surgery is paralysis of the vocal cords, as the thyroid gland pretty much sits on top of the cords. During surgery, alarms are placed on the cords that go off if the surgeon even gets close to them. I remember waking up in the recovery room afterward, with the surgeon by my bedside, prompting me to talk to him immediately upon waking. When I spoke a few words, he became so relieved, as he then proceeded to tell me that there had been a nodule that was stuck in my left vocal cord and he had had to touch the cord to get the nodule out. He had been so worried that my cord would be paralyzed. Upon hearing my voice, he pretty much said, “Phew! If you're talking now, you should be fine! Three days later, my voice started to go hoarse, and then basically disappeared. I waited a few days and with no improvement, went to see the surgeon. He walked into the examining room and said hello, and with my “hello”, stopped in his tracks. He put a scope down my nose and looked at the cords, but he already knew the outcome. My left vocal cord was paralyzed, just as he had feared from the beginning. I had a voice for those three days only because of the swelling from the surgery, which allowed the cords to touch, hence giving me a voice. Once the swelling went down, the left cord moved away from the right side and since they no longer touched when I talked, I no longer had much of a voice. He tried to be a bit nonchalant as he continued to talk to me, telling me that he has seen people recover from this situation, but it could take all the way up to a year. And he then said, “And sometimes the cord remains paralyzed. We'll just have to wait and see what happens.” I sat there, and even if I could speak out loud, I wouldn't have known what to say. So, stunned silence it was. I left the office in tears, and just couldn't grasp the fact that I no longer had a voice. And for how long?? All I basically had was a whisper. No one could hear me unless I was standing right next to them and even with that, you really had to listen. There was no talking on the phone, no going through any drive-thru's; no conversations. Over the next few weeks, I became so frustrated, so angry. To make things worse, my mother (who lives with us) was already hard of hearing, and with my “new” voice, she couldn't hear anything I said. The only person it made no difference to was Derek, my son. He was deaf and communicates with basic sign language. People would try to make me feel better and say, “Well at least you know sign language and can still communicate!” Well, guess what? Most people DON”T KNOW sign language! If we went to a restaurant, I had to have someone else order for me. In a crowd of people, I felt alone, isolated. In the evenings, I would crave conversation with Bob, but he wouldn't even allow me to try to talk for fear of making it worse. He found me a little device, an amplifier that had a headpiece with a microphone attached, that we bought online and it actually helped a little bit. I would wear it around my waist, with my headpiece on and the mic right in front of my mouth. I could control the volume and could turn it up or down as much as I needed. So this amplified my whisper of a voice and made things a little better. I felt like a tour guide at Disney World. Except my world was not the happiest place on earth! Six months after the surgery, there was still no improvement. The surgeon recommended that I go have a procedure done that would give me back my voice. He made it sound like no big deal, so I scheduled it and became excited thinking I would finally be able to talk again! Well, it didn't take long for that experience to become a nightmare for me as well. This is what was supposed to happen: a scope would be placed through my nose with a camera on the end so the doctor could see the vocal cords; then a needle would be inserted into my neck, where an injection of a collagen-type substance would be placed next to the left vocal cord, which would then push the cord over to meet the right vocal cord and upon them touching, voila! I would have a voice. That's basically how my doctor explained it. So, the doctor came into the room, and it seems he forgot to bring his good bedside manner. He picked up a needle of anesthesia,stuck it into my neck to numb the area, and as soon as he finished with that injection, he turned around and picked up the other LARGE needle and proceeded to plunge it into my neck before waiting for the anesthetic to take effect. All the while, I had a scope down my nose while I was sitting on the table with a needle in my neck, and he's saying “Don't move!” and I'm just sitting there wanting to scream from the pain and kick him where it hurts. So, he finally removes the needle from my neck, and the scope from my nose, and I sit there and half a minute later, everything goes dim and the room starts to spin. Yep, I was passing out! And do you know what that doctor did? He comes over, looks at me and says, “oh, she's just having a vaso-vagal attack”, turns his back and walks out the door. He left the other doctor and nurse in the room with me, and he never even came back to see how I was! Right around the one-year anniversary of the surgery, my voice started to sound like my own again. I had a follow-up visit with my surgeon, who was happy to hear my voice. I knew it had finally healed and as he scoped me, he got very quiet. He then told me the cord was still paralyzed. Apparently I was only speaking because of the procedure. At this point, I knew I had to let go of worrying about my voice. It is what it is, and at least for now, I sound like my old self. So, what did this experience teach me? What did I gain during this fiery trial? Let me tell you, I did have it out with God quite a few times during that year. I cried a countless amount of tears; my frustration level hit all time highs. My anger sometimes got the best of me. But all the while, God showed me He was with me. He let me yell, let me rant and rave. And still He loved me. He used His people to minister to me. Friends, family, church family. I bet many of them don't even know how He used them. That they were instruments in showing me that I could get through this. That He didn't forsake me. And most of all, I thank my husband and my daughter. They were my strongholds when I couldn't stand any more. When I couldn't take one more minute of frustration and anger. I thank God for everyone who helped me survive this ordeal. I don't know how long my voice will last. The collagen substance isn't a permanent fix. But it doesn't matter. What matters is that I'm talking. I have a voice, for now at least. There's no point in giving any more thought on the matter. I will say this: appreciate your voice. Like all things we have in our lives: we don't miss something until it's gone. You might be wondering what does “Uh Oh” have to do with anything? Well, if you can say uh-oh, its only because your vocal cords are working. I had speech therapy at first, and the therapist tried to get me to say uh-oh. And I couldn't do it. And boy, did I want to say it!! So, one of the first things I spoke out loud after that terrible injection, was “uh-oh”. And what a beautiful,hoarse sound it was. Go ahead, say it. And appreciate the sound of your voice today! Last Saturday, I had a wonderful excursion on the motorcycle with Bob and a group of friends. It was a day that helped me breathe freely again, refreshed my spirit, and I thoroughly enjoyed it. With the help of Derek's dad Joe, who took Derek for the day and overnight, and Brooke, who came to the house to stay with mom, I was able to be free. At least for a little while. And it did a world of good for me. I've even heard people say how relaxed and “good” I looked Sunday morning at church. Hmmm, I wonder what I “normally” look like?? I guess sometimes I feel like the weight of the world is on my shoulders, and there are some days I'm really dragging. But just one afternoon out in the fresh air and with friends helped bring me back to the surface again. It was Superbowl Sunday. After church, I was on my way to meet up with Joe to pick Derek up. When I called him to check in, he said Derek had started vomiting around 11 o'clock. It was now 12:15. He said he had seemed fine in the morning, ate breakfast and lunch, was riding his bike, and then he just started vomiting. He didn't have a fever, and otherwise seemed like nothing was wrong. Except the vomiting. We met up and the minute I saw Derek, I knew something was wrong. He got in my back seat and immediately started wretching. But the only thing coming up was spit and snot. And he was making a horrible wretching sound. I knew immediately he needed help. I needed to get him to an ER. That's not my normal reaction to Derek vomiting. Derek had a kidney transplant 27 years ago, and things are never “normal” with him. He can dehydrate very easily; it could have been his medication causing a problem, even rejection of the kidney. A virus could wreak havoc in him. We went to an ER close to proximity to where we had met up, about 45 minutes from my house. I had my mom with me as well, as I had just left church. I wanted the doctors to draw blood to check his kidney function and to see if might have a urinary tract infection. Meanwhile he was wretching every 20 minutes. There was no wait, Derek was brought in right away. An IV was started and blood was drawn. Urine was tested. And the wretching continued. The blood results came back, and everything looked fine. Kidney was good, no infection. The wretching continued. I thought food poisoning, but Joe said they all ate the same thing. No one else was sick. The doctor ordered xrays of his abdomen, thinking maybe he had an intestinal blockage. The films came back normal. No blockage there. The doctor then decided to give him IV fluids, to keep him hydrated. I agreed. She said she wasn't comfortable discharging him in this condition, and there was no way I was taking him anywhere. His primary doctor was called and the decision was made to take him to the hospital close to my house where his doctor was and admit him for observation. Transportation had to be called, as he now had an IV and would not be allowed to leave in my care. It was now 5 pm. And the wretching continued. Every 20 minutes. This wasn't how I had planned on spending my Superbowl Sunday. We had the game on in the room we were in. Meanwhile, Joe had taken my mom home. I now had to call Bob to pack me a bag to bring to the hospital. While we were waiting on the ambulance, Derek started to wretch again, and as I ran over with the bin for him to use, he made this awful face as he was wretching, and it looked like he was choking. Nothing was coming up. I yelled for help, and all of a sudden, he wretched and all this fluid came up. It looked like blood. I thought he was vomiting blood. It was darkish red/brown, and there was a lot of it. And then something else came up. Large chunks of hot dogs. All this went all over my hands as I was holding the bin for him, but this was such a violent wretch, it didn't all make the bin. And I lost it. I thought it was blood. I had kept my calm up until now, when I realized that for six hours, my son had been choking on hot dogs. And couldn't tell me. The horror was almost too much to bear. When he finished, he sat back, crossed his arms, and looked so relieved. It was over. All I could do was cry and hug him. Only by the grace of God, and God's protection, was he still alive. All he had needed this whole time was a good ol' Heimlich. Joe didn't tell me he ate hot dogs. I don't know if I would've figured it out even if he did, who knows. But I know my son. And I knew he was in distress. We still had to go to the other hospital. So Derek rode in the back of an ambulance by himself and an attendant, and I followed behind. Every few minutes I could see him in his stretcher, waving at me through the window. He was fine as long as he knew I was coming. He made fast friends with the ambulance attendant, and I saw the guy put his hat on Derek. Then I saw them both clapping. And I cried all the way to the hospital. We were brought into the ER at the other hospital, a doctor came in who had been briefed by the previous doctor. I told him that Derek would be fine now, but I wanted him to have a drink to make sure he could manage now. He was a little afraid to drink, but once he did, he was thirsty! And he kept it down, and we went home at 7:30 that evening. And Derek high-fived everyone as he was leaving, and made a beeline for the car. To say he was happy to be going home is an understatement. He was back to being Derek. My son has had countless miracles performed to save his life. As soon as I knew we were in trouble, I asked friends and family for prayer. And I truly believe that God reached down and gave Derek the Heimlich he needed that brought the hot dogs up. It took 6 hours. And it could only be the grace of God and His protection that Derek didn't choke to death. Or could function that long as his trachea was blocked. Derek can't speak. How unfathomable it is to know that he couldn't tell me he was choking. And that he had to suffer this way. But God knew, and he rescued Derek once again. On Monday, I had to go for a scheduled cardiac stress test. Gee, I wonder what THOSE results will show! Last weekend, I was a biker chick. Sitting behind my Wild Hog, going on a wild adventure. Yep, leather jacket, boots, the wind blowing through my helmet, er, hair. 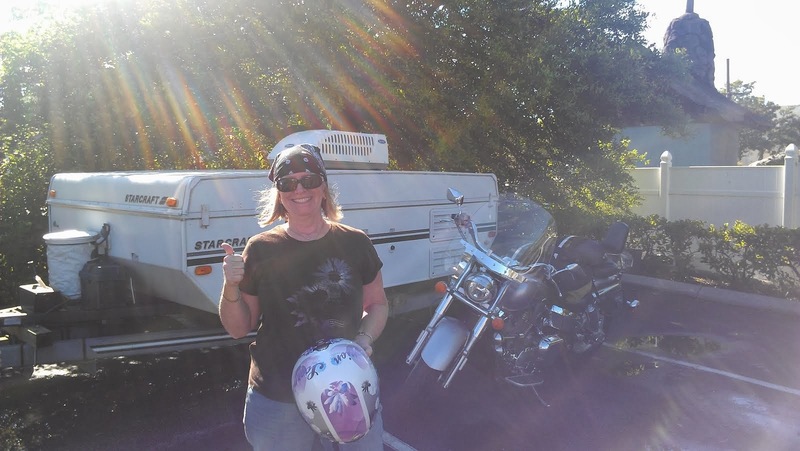 Do biker chicks wear helmets? And Uggs? Hmm, this one did. Does that make me an imposter? Oh well. I was a biker chick in spirit then, if nothing else. Have you ever seen the movie “Wild Hogs” starring Tim Allen, John Travolta, John H Macy, and Martin Lawrence? It's about a group of middle-aged suburban guys going on a guy adventure across country on their Harleys. No, they didn't have any biker chicks on the backs of their bikes. But they did have plenty of adventure. Watch this movie for a good laugh if you haven't seen it already. Well, I have a feeling that's what Bob was picturing this ride to be as he was singing at the top of his lungs before the ride,“Get your motors running, head out on the highway” the “Born to Be Wild” song by Steppenwolf. Steppenwolf? Really? Apparently he was ready for some adventure! He was beginning to scare me! Originally, this ride was supposed to be a guy thing. Just Bob and a few guys from our church. (That's right. Wild Hog Church Guys.) Until Bob said, “You need to come too. We need our chicks on the backs of our bikes!” What?? A few of the wives of his guy friends were a little hesitant in wanting to go; they would rather have gone antique shopping while the guys were out adventure riding. I must admit, I thought antique shopping would have been more fun as well. But because I love my husband, and because he does so many things just for me, I agreed to the ride. He was SO excited I agreed to get on the motorcycle. It had been a long time. The last very long ride I had was miserable and I've refused to do it again. He doesn't have a “cruiser” type bike; it's a cross between a dirt bike and street bike. Great fun for him, not so much for me. He looked so darn happy singing his “Wild” song. The weather that day was perfect. And I mean perfect. Bright sunny blue skies, a cool breeze, a wonderful 72 degrees on a wonderful Florida winter day. Our group met up at our church and took off to ride all around Lake Okeechobee. There were 5 bikes, 4 couples, and one Lone Ranger, who couldn't quite convince his wife to come along that day. Hmm, maybe she went antique shopping! Anyway, Danny & Becky led the pack, as they were on a 3-wheel trike that was Bumblebee yellow so we knew with them leading us, we would definitely be seen on the road! We followed second, then Gary & Susie, Doug & Bev, with Dennis bringing up the rear. Heading across the state on Southern Blvd, there's not much to see but fields of sugar cane, deep black, rich soil, and gators cruising along in the canals all along the highway. Traffic was light, and even the smell of burning cane was wonderful. I started to breathe in deeply and felt myself relaxing. This was a day I desperately needed. It had been a long time since Bob & I had done anything fun like this. We stopped a few times along the lake to check it out and enjoy the scenery. I was soaking up the experience big time! We stopped for lunch in Okeechobee at a restaurant called Lightsey's Seafood Restaurant, who boasted, “If it swims, crawls or hops, we probably serve it!” Hmm, this could be very interesting. The food was actually delicious (I ate a blackened grouper wrap with corn salsa on top), the atmosphere was friendly and comfortable, and the camaraderie was priceless. Fun times. As far as the adventure goes, there was no throwing away the wrist watches, or blowing up biker bars, or fist fighting. We left that for the real Wild Hogs. But our adventure was certainly memorable. And relaxing. And just what I needed. And when we got home and got off the bike, Bob grabbed me and kissed me and with a big smile on his face, said, “Thank you!”. My heart melted, and I knew his adventure was everything he had hoped it to be. And so was mine. So, when & where is the next one? We've added a few new faces to our crew. Five hens, a rooster, two rabbits. The crew already consists of 5 cats and a dog. It seems our flock is growing! Oh, don't forget about the five bee hives in the front pasture. I guess I should count them too. I have always been an animal lover. And I especially love horses. Up until the last few years, I had horses for 23 years. But life was getting a bit complicated and with no more time left to take care of them, I had to find good homes for them and let them go. It wasn't fair to them. I still really miss having horses in my backyard though. Back in the summer, a feral cat decided she was going to take up residence on our property. She was tiny, skinny, and very hungry. I started leaving food out for her, and she would sneak in a few bites before my other cats would chase her off. But she was a determined little thing, and after about 3 months, she decided I wasn't going to kill her and she became friends with me. She now sleeps in our garage at night, and sometimes comes in the house to sleep for a short time when the other cats are out. They're still not too crazy that we've adopted her. I named her Spice. Now to the hens. We decided to make use of our horse barn and Bob built a chicken coop inside one of the horse stalls. We bought three hens and a rooster, with intentions of having them to provide us with fresh eggs. I didn't really want a rooster, but we decided to get one because of the predators that live around us (mostly my cats!) with the hopes that he would be able to keep them at bay. We're hoping the rooster gives them something to think about! The hens we brought home were about 3 months old, and need some time to grow, so we decided we are not going to let them out until they are full grown. After the first three days, Bob found one of the hens dead in the coop, after something had gotten inside and had it as a late night snack. Apparently the coop wasn't secure enough. So we spent the whole next day reinforcing it and it's been fine since. So I went and picked up three more hens; two from the same brood as the original ones and one hen who is older and is already laying. I named the hens Molly (for “Good Golly Miss Molly – she is the oldest & biggest one), Lucy (she's a Rhode Island Red), Hannah ( a very sweet, friendly hen), and Laverne & Shirley (they look like twins). The rooster is Roy. Miss Molly bosses everyone around in the coop, even Roy. He's petrified of her. Hopefully he will grow into his rooster-ness and tell her a thing or two! We also got some rabbits. Rabbit poop makes the best fertilizer for gardening and we would like to start growing some of our own veggies. They also make a delicious stew, according to Bob. So he wanted to have rabbits down in the barn as well. I didn't name the rabbits. It's hard to name something that will end up at your dinner table...and I don't mean as dinner guests! Kind of like the oysters that thought they were invited to dinner with the walrus in Alice in Wonderland. Anyway, the rabbits are Bob's responsibility. I don't want to even look at their fuzzy little faces. So what does Snow Red have to do with anything? Well, my neighbor says I'm just like Snow White with the way the animals react to me. She said they are just drawn to me. Except I don't look like Snow White. Strawberry blonde hair & freckles? Which is where Snow Red comes in; close enough. Anyway, there might be something to that. One time I heard a bird chirping down at the barn. I opened the back door to see where it was, and saw a parakeet flying around down in the trees by the barn. I stood at the back door and called to it, saying, “Cme'ere little bird, come on in the house”. And guess what? IT DID! It flew straight from the barn all the way up to the house and flew right inside the house through the doors I had open! I almost fell on the floor!! I ended up finding it a home, as my cats would never have let me keep a bird in the house. Then there was the time I was driving in my neighborhood and saw a horse galloping down the middle of the main road towards my car. At the last minute the horse turned down a street and just a few houses down, just stopped. I got out of the car and it let me walk right up to it and hold it. I called Bob and he came down with a halter and lead rope which I put on and proceeded to walk the horse to my house and put it in the pasture. It's owner found it later that day; it seems they had just moved to a new house in the area and somehow it escaped through an open gate. And then there's Roy, the rooster. He likes me. He meets me at the coop door when he hears my voice, jumps up on the box to watch me when I'm milling around the barn, and will stay near me when I go inside the coop. Roy is my friend. Then there's Spice. She made friends with me, mostly only me. She doesn't have much tolerance for anyone else. There's a possum living in the cabbage palm out front. He doesn't run away from me. He should, because if I find him anywhere near the chickens, well, let's just say I might become Annie Oakley instead of Snow Red! And now the turtles. Yesterday, I moseyed on over to check out the canal that's on the side of our house, and while I was standing there, two turtles came to the surface and poked their heads out of the water and just stayed there looking at me. So I went and got some food and fed them, and guess what? They were waiting for me this morning when I went over to the canal. Just knowing I was there to feed them. My neighbor says that she expects to see a line of animals just waiting outside my garage some morning. Just knowing Snow White, er, Snow Red, lives there. I'm ok with that; just as long as the seven dwarfs don't show up. I think I'm plum out of space here in our home in the woods! I'm Karen Cox, author of Brewed In Love. Thank you for joining me as I share with you the challenges and blessings of living life with a special-needs son, a mother with Alzheimer's-related dementia, a computer programmer/bee-keeper husband, a married daughter, a grandson and granddaughter, 3 cats, a dog, 8 hens, 1 rooster and a bevy of rabbits. I will share my stories ~ past and present ~ to inspire you, recipes to delight you & adventures to entertain you. So grab a cup of coffee, sit a while, and let me welcome you to my world!